This is huge. One thing I’ve noticed serving in the church world is the isolation and inward nature of those who work in that space. Look out to what the wider world is doing. Look at your peers around you and check out what they are doing. Ask lots of questions. I do. I connected in with this experienced and knowledgeable community and have learnt so much with them sharing so much of their knowledge base. Check out this excellent post from Darrel about he learnt when he redesigned his church website. 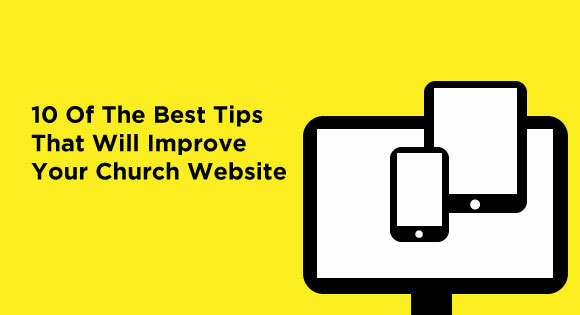 Did you know that your church website is the digital front door to your church for visitors? Have you written your copy as for people who have never stepped into your church? What kind of information do you have on your website and why? Read more here. Only a few years ago less than 20% of our church website traffic was from a tablet or smart phone. That is now at 60%. Is your church website ready to look spectacular on the go? Read more about what the cost if your website isn’t mobile friendly here. Did you know that giving doubles on mobile-responsive websites? Read more here. I love this idea. Many churches over complicate their website. They write in long-form when they should be thinking scannable copy. Some also list every ministry that has ever lived or breathed at the church. Some that would be for sure out-of-date. Ask yourself this question, does your audience really need an essay on your creative ministry? Or does it just need to know how to serve in the ministry? Read some great thoughts here from Brady Shearer. Did you know that 94% of people cited poor web design as the reason they mistrusted or rejected a website. Imagine that for your church? You are just as likely to turn people away as to open the door with a poorly designed website. Invest in building a team who can help you look like the church you want to be. Read more here. Think that you no longer need a church website, that you can just rely on social media? Wrong. You own your digital property on your website. You don’t own your social media account. Everything you do should point back to your home-base. Read more here. How quickly can someone give online on your website? Did you know that online giving is now mature and that most people trust the web to contribute to non-profits, churches included. Read more here. People are visiting your website all the time. If your don’t listen to your audience it could actually cost you money. Read this story about how one casual giver became a regular giver because of their church’s new online giving system. Over 50% of the traffic to our website is organic searches. People are finding my church website via their search engine. And most of them are visitors. Is your church website SEO ready? Read more here. Do you have any tips to help build a brilliant church website? Got any questions about what I’ve written? Comment below. First, thanks for linking to my article on Churchmag. Second, one thing I found out is that all churches I investigated in a recent research project want to connect their digital audience to an IRL connection. Sure, many post to their social media platforms, but only a percentage. Yet every top church had a phone number and physical address on their website for viewers to utilize when they needed it. That would be great Eric. I’ll DM you my email address and lets go! There’s a wealth of information and knowledge contained in this post. As a design agency who is dedicated to helping churches and ministries communicate the Gospel Message online, this has to be the one thing that many churches do not get. I will use the term “marketing” loosely and have started to incorporate that into my own digital designs when I work with churches. Half of the battle is getting them to realize that it really is just like marketing a business but with a special message involved. As both of us very well know, it’s about causing a reader or visitor to act or respond. The ultimate goal at the end of the day is to open the doors of communications to those who are not in the church. Thanks for sharing this amazing content! Here are five ideas I have for church web developers…. 1. City and State on the front-end of the Home Page. If anyone is interested in your church they want this info. Half of church web sites make you play hide and seek to find where it is located. 2. Have a purpose for the site. Don’t just do a web site without a marketing objective. why would anyone come back to the site? 4. Be original. If you “borrow” graphics from another church site your visitors will know it. Most churches have at least one person with some artistic ability. Ask them to help. 5. Keep it simple. Pop-ups and embedded music do NOT enhance the experience. Clean, simple and easy to navigate. I have been on sites that you need GPS to get around. You might be the world’s best developer, but only in your own mind.